How can we foster more South-North projects on violence prevention that don’t cost a fortune? Can a grassroots project with a lot of volunteer enthusiasm but a low budget succeed in helping victims of violence? Medical expertise coupled with commitment and creative thinking have always been hallmarks of our members’ work, and we are pleased to report that a recent IPPNW project that capitalizes on those traits will be published in the peer-reviewed Injury Prevention, a BMJ publication. You can read the abstract here. 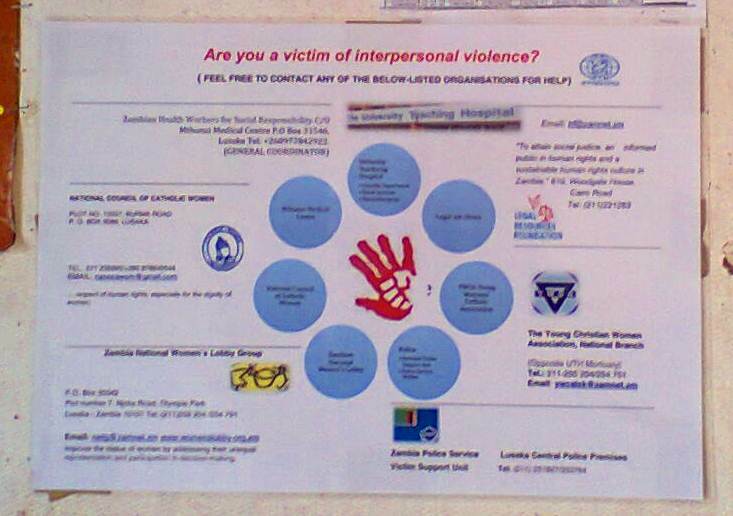 “Improving care for victims of violence in resource-poor settings such as Lusaka, Zambia: results of a low-budget intervention,” describes a collaborative project of IPPNW affiliates from Austria and Zambia. It was designed to raise awareness about the social, legal, educational and clinical services available to survivors. And, to facilitate improved networking and communications among the service organizations and agencies providing care with to view to improving the management outcomes of victims of interpersonal violence in Lusaka. The project entailed a lot of hard work over several years, and was conducted on a shoe-string budget due to a great collaboration between the affiliates as well as and local partners in Lusaka. More than 30 medical students from Austria and Zambia participated in collecting data in the emergency room at the University Teaching Hospital in Lusaka, Zambia and at agencies that provide services to survivors and their families. Read about one student’s experience. Our community and medical connections through IPPNW Zambia, and involving local partners including staff from the hospital and social service agencies was crucial to the success of the project. We hope that the experiences of those involved will lead to a sustainable cooperation. Data collection spanned a year. Surveys were conducted before and after a low-cost intervention of distributing brochures, address/contact cards, and posters that included agency contact information at key locations where victims would be seen. Distribution locations included the police victim assistance unit and the hospital emergency room. Results showed improved awareness of services after the intervention, a key first step to enable victims to find appropriate assistance. In our paper we describe lessons learned on how to implement such a project in a resource-constrained setting such as Zambia, where funds for health care are meager. The hope is that this can provide ideas for instituting such programs in similar settings in other cities in sub-Saharan Africa. The project involved training in Austria for medical students who participated in the exchange. The day-long trainings included background on violence prevention and a review of project goals, data collection procedures, etc. It has also involved two meetings of local partners. Partners include Lusaka’s University Teaching Hospital, the Young Women’s Christian Association, the Zambia Police Victim Support unit, the Zambia National Women’s Lobby, The Catholic Women’s Association, and the Legal Resource Centre. Participants provided input into the project and shared ideas for continuing communications and information dissemination. Staff members suggested additional training as a top priority to improve patient outcomes. The project’s proposed regular networking meetings offer a good opportunity for this – a more extensive schedule with regular information sharing should be considered. 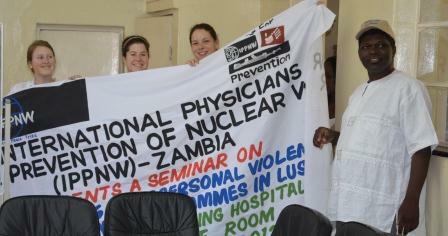 IPPNW Zambia is currently planning to conduct a follow-up meeting in Lusaka with all the participating partners. We are encouraging colleagues to adapt or replicate this initiative so that we can compare results and hopefully replicate it for the benefit of victims of interpersonal violence. For more information: Dr. Michael Schober at michaelschober1@gmx.net.